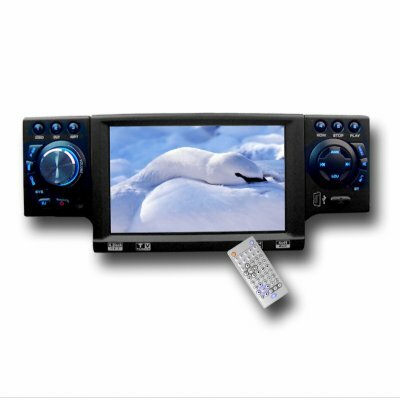 Successfully Added Big Screen Car DVD Player 1 DIN - Removable Front Panel to your Shopping Cart. Single DIN car DVD player with extra large 4.2 Inch TFT LCD Screen which can be detached for added car safety. Such a small looking 1-DIN casing hides a whole lot of car entertainment value. This models signature features include an analog TV tuner, great 45W x 4 sound output with sub woofer IN, compatibility with a great selection of car audio and video file and disc formats, a rearview camera IN, and a Dolby digital audio decoder for great sound reproduction from DVD.s. With safety and entertainment, as well as the lowest wholesale prices available on the market, this is another Car DVD player brought to you by Chinavasion that makes a great upgrade for your own car or even better item to resell at your physical store or online storefront.